Wholesale Supplier of a wide range of products which include conventional tank rotators. 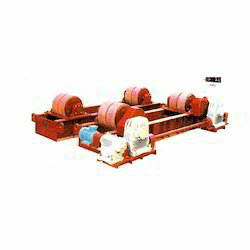 Our organization is amongst the top supplier of premium array of best quality Conventional Tank Rotators in the industry. These conventional tank rotators are used for positioning and rotating cylindrical vessels for efficient use. Our conventional tank rotators are fitted with heavy duty wheels with abrasion proof and solid rubber rims. These conventional tank rotators are very robust and have excellent functionality for efficient use. We are offering these conventional tank rotators to our clients at market leading prices. Looking for Conventional Tank Rotators ?